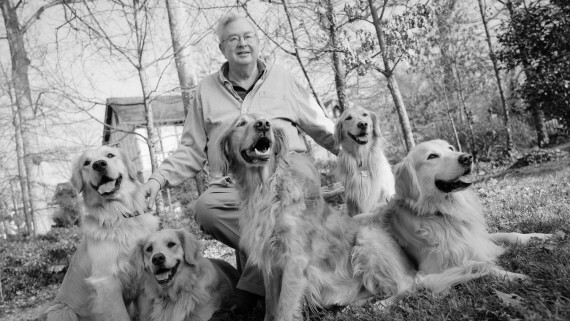 Businessman, newspaper publisher, and philanthropist Randall B. Terry, Jr. of High Point, North Carolina, cherished the companionship of nine Golden Retrievers he named for figures in Greek mythology— Achilles, Ajax, Apollo, Athena, Diana, Nike, Rumor, Venus, and Zeus. When Nike became ill in 1998, Mr. Terry’s veterinarian referred him to the Internal Medicine Service at the NC State University Veterinary Teaching Hospital. The care and compassion Nike received impressed Mr. Terry and led him to become a friend and supporter of the College of Veterinary Medicine (CVM). Mr. Terry joined the North Carolina Veterinary Medicine Foundation (NCVMF), a group organized to attract funding for the CVM. He chaired the first CVM campaign, which resulted in $10 million in gifts and pledges to support student education. A champion of preparing the next generation of veterinarians, the philanthropist personally donated more than $4 million in challenge grants and student scholarships while serving two terms as NCVMF president. Mr. Terry died in May of 2004 and in the fall of 2005 the R.B. Terry, Jr. Charitable Foundation provided the CVM with a $20 million gift to initiate the philanthropist’s vision. An innovative public/ private partnership of state appropriations from the 2006 North Carolina General Assembly combined with private giving that continues to be matched by the Terry Foundation is making the $72 million Randall B. Terry, Jr. Companion Animal Veterinary Medical Center complex a reality. Beyond the immediate care for companion animals, the Terry Center and the continued support of the Terry Foundation is instrumental in helping develop the emerging Centennial Biomedical Campus and encouraging CVM efforts in biomedical research, bio- and agro-security, food animal health and food safety, ecosystem health, animal welfare, and the critical job training of the next generation of veterinarians and veterinary scientists. The 110,000-square-foot Randall B. Terry, Jr. Companion Animal Veterinary Medicine Center at NC State University. Terry had a vision of a spacious and welcoming veterinary medical center that would be a national model of excellence. The goal was to ensure compassionate and leading-edge specialty health care for companion animals by surrounding a dedicated staff with advanced medical facilities and state-of-the-art diagnostic and treatment technologies. This goal has been achieved with the 2011 opening of the 110,000-square-foot Randall B. Terry, Jr. Companion Animal Veterinary Medical Center, one of the nation’s largest and most advanced veterinary hospitals. With a focus on patient care, client comfort, and staff efficiency, the Terry Center is designed to help clinicians exceed client and referring veterinarian expectations for specialty health care. The Terry Center’s stated mission is to partner with veterinarians and provide excellent and compassionate medical care; advance the veterinary profession through medical innovation and clinical research; and prepare the next generation of veterinarians and veterinary research scientists. When Rob Loose graduates from NC State’s College of Veterinary Medicine, a position in a small-animal general practice awaits him. He feels ready to succeed there, thanks to the innovative education and medical research, advanced technology and quality of care that the college is known for- excellence that is made possible due in large part to Terry’s legacy. Now, even more students will get the same kinds of opportunities. The R.B. Terry Charitable Foundation has pledged a further $16 million to support scholarships, faculty and research endowments within the College of Veterinary Medicine. This generous gift－which will effectively double the student scholarship endowment- furthers a visionary legacy through which the foundation, formed by the late Randall B. Terry, Jr., has made significant investments in the college over the years. The opening of the Randall B. Terry, Jr. Companion Animal Veterinary Medical Center in 2011, concluded 12 years of planning and building one of the nation’s most advanced veterinary medical facilities and ushered in a new era for the College of Veterinary Medicine community. At that time, several members of the CVM community were selected to provide their personal perspective on how the Terry Center will advance the health and well being of companion animals, veterinary medicine, and the preparation of the next generation of veterinarians and veterinary researchers. Here are their comments.